One of two things is going to happen: either Lee and I are going to get used to crazy, horrifying disasters or we’re going to perish in the ocean. That’s what I’ve decided the fates have in store for us after our latest and greatest adventure. We’re motoring South along the Jersey coast, almost to our destination of Atlantic City. 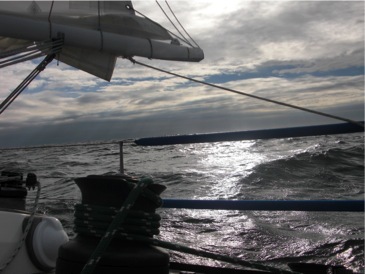 We spent the day jibing back and forth in 15-20 knots of northerly wind and large waves. Pirat reached her top speed since we’ve owned her (12.2 knots baby!) surfing down one of these waves. It was a long day. We left the 79th st. Boat Basin at 4:30am and successfully navigated New York harbor in the dark without getting run over by a freighter, tug boat, barge, or ferry. The city lights were beautiful but they made spotting boat lights difficult. Once again, we were glad we had our AIS and RADAR (not to mention my sharp eyes). Oh boy, sunset. That means dark! 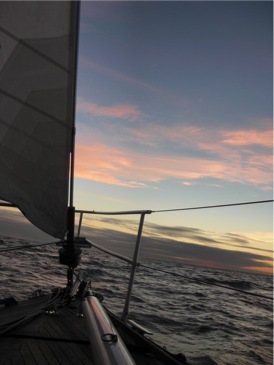 By 6pm the wind had died and Lee and I had taken down the sails for the last 10-15 miles to Atlantic City. Thanks to the recent time change, it was dark. The moon hadn’t even risen yet. Lee and I were sitting across from each other in the cockpit, finishing our sweet potatoes from dinner, when I looked over my shoulder and saw a wall of whitewater approaching the boat. It was a breaking wave. It was seconds from hitting us. I yelled something like “Oh my god, Lee!” and we both sprang into action. Lee got behind the wheel and looked at the chart plotter to see if we were drastically off course for some reason. My first thought was It’s a rogue wave! Must close the hatch so the boat doesn’t fill up with water! I dove for the hatch and somehow got down the companionway. This is where things get fuzzy. I don’t know if I got the hatch closed before the wave hit us. The boat rolled violently to starboard and I flew backwards onto the nav table seat. I heard and felt all kinds of stuff go flying from the high side of the boat. I also felt a violent jolt as the keel hit bottom. We were running aground. The waves would smash us and we’d sink. As Pirat righted I stood up, grabbed the ladder, and looked out the hatch. Lee was at the helm, looking appropriately freaked out. There were more waves on the way. The water all around us was white like in the surf zone at a beach. “It’s an uncharted shoal.” Lee answered. There were more frantic exchanges. It’s not on the map? How do we get off? Hold on!! Hold on!! Apparently a couple more waves hit us. We probably hit bottom a second time. Everything is a blur now. I know I clung to the edge of the hatch, swinging as the boat heeled way over again. There was a lot of crashing – of water and debris down below. I think it was when I looked up through the hatch the second time, exclaiming “What do we do? !” that Lee said “I don’t know. I can’t steer!”. That was not good. Our rudder is smashed. We’re crippled and stuck on this shoal in these waves. I’m going to have to call the coast guard. Do I set off the EPIRB? I hung from the companionway as Pirat went down again. This time I screamed – all-out screamed in sincere terror. I’ve never been so scared in my entire life. My next mission was to get our life vest/harnesses. I pulled them from the starboard pipe bunk and crashed back up the ladder to give Lee his. We were so stupid to not have them on, so stupid. As we frantically buckled the harnesses, the waves seemed to give us a break and Pirat forged ahead, the engine still running. We weren’t aground but we were clearly in very shallow water. What a relief! He turned the auto pilot, off and asked for the big flashlight. I brought it from down below, stepping in something slippery on the way. The flashlight didn’t help but I could see more breaking waves ahead to port. Lee managed to avoid those breakers and drove us safely off the shoal. It took a while for our heart rates to return to normal. We looked at the boat, at each other, and at the malicious ocean around us. Everything seemed to be intact. How could we have hit an uncharted shoal less than 2 miles off the coast of New Jersey? Lee double checked the chart plotter. It was supposed to be at least 20 feet deep where we we’d hit bottom. A shallower sand bar must have developed recently and the ginormous waves exaggerated the shallowness by sucking up water, leaving their troughs barely above the bottom. Eventually I went below to check for damage. I was afraid to turn on the light but when I did there wasn’t anything too horrible to see. The floor was strewn with fruit, gloves, pots, dishes, the smashed rest of my sweet potato, and a few items from the galley cupboards. Our extreme leans to port dislodged things that had always been secure before. My recipe box, for instance, sits on a shelf with a substantial rail on it next to the galley. It had flown off and spewed it’s contents on the galley floor. I lifted up the floor boards but found no more than the usual water. The keel bolts looked fine. Lee and I weren’t out of the woods yet. We had to get to Atlantic City without passing over any more 20 foot depths, which we now considered potentially dangerous. Lee took Pirat way out beyond any potential shallow areas but the long channel into the harbor passed over the shoals and had a few single digit depths. I suggested we call up the Coast Guard station in Atlantic City to make sure the inlet was safe in the current conditions. Lee got a hold of them on the VHF and they said we should be fine as long as we go all the way out and straight in through the channel. The last hour of our trip was a white knuckle ride spent glaring at the depth gauge and scanning the dark water for breaking waves. We made it to the channel, then down it to where the breakwaters stopped the swells. We’d given up our plan to anchor in a spot we’d never tried. It was too dark, too cold, and we were too shaken. We helped ourselves to one of the many vacant slips in the Trump Marina, where we stayed on our previous Atlantic City stops. Docking took two attempts. Our brains and bodies were shutting down. A good night’s sleep and more thorough inspection of the boat has us on the mend. We laid low today, cleaning up the carnage and enjoying unlimited power after plugging in at the dock. It’s hard to face another day in that ocean but we need to keep moving. We’re not going out in dangerous conditions or anything but we’re going to leave tomorrow even though the waves will still be big. 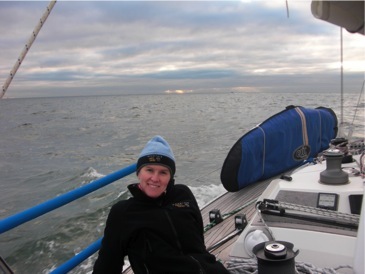 The run to Cape May isn’t nearly as long as yesterday’s passage (over 100 miles with all our jibes). We have to get back on the horse, again. I’m just a little paranoid about waves now. I can’t get the image of that breaking wave out of my head. I know it was really the shoal that was the problem and we’re definitely going to play things on the safer than safe side where those are concerned from now on. New York city was really fun, by the way. It was cold and stormy but we enjoyed a couple long runs in Riverside Park and roamed around the city. We spent some time in internet cafes, visited the enormous and beautiful Natural History Museum, and had a nice dinner at a Greek restaurant. Most importantly, I got some new warm socks to replace the pairs I left behind. I’m gonna need those socks until we get to the Caribbean! Wow, that story kept me on the edge of my seat! I’m so glad you and Lee and Pirat are ok! And btw, I’m so jealous you were in NYC, it’s on my list of things I want to do in the nearer future. You should definitely go to New York! This was the second time we’ve sailed there and it was so much fun to just wander around the city. You can get anywhere on the subway and there are cool things to look at everywhere! Please don’t die! Even though I knew you must be ok (someoone was blogging) I was still freaking out. Right now, my most urgent goal is to make it to North Carolina to visit you so I promise not to die before then! in city traffic, driving a car, riding a horse, etc. I am scared for you and Lee, but proud of you as well. May I scream, too? Yes, please scream for me. It’s very therapeutic. And you’re right, there are plenty of other really, really dangerous things that people do every day without thinking twice. You should check out Lee’s post on this incident by the way. It’s funny to see our contrasting perspectives. But I second Sarah– Please don’t die! I want to go to your wedding. Also, I wanna read Lee’s blog!! Send me a link to it on mine. I know, we are much less scared after facing these situations. Then something we weren’t scared of comes along and surprises us! But I promise we won’t die!